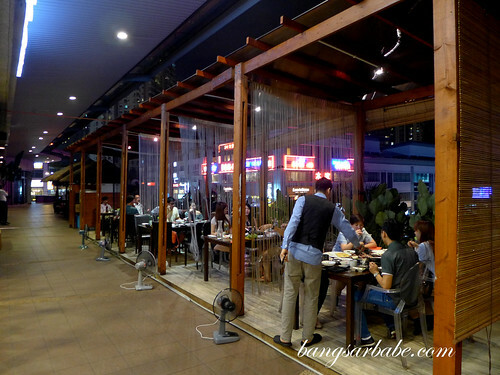 Apgujeong is a Korean restaurant located above Ole Ole Bali in Solaris Dutamas, and it comes recommended by a Korean friend. She took rif and I to dinner recently and we found the food quite commendable. 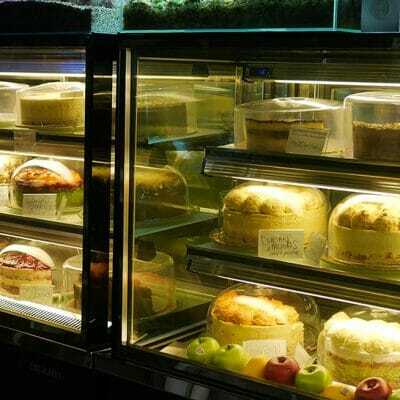 The menu is large, but the servers make it less intimidating, and they are quick, even insistent, in offering guidance. The runner who delivers the food (and chopsticks, and hot coals) to the table actually runs, and the other servers moved fast as well. Banchan, and this was just part of it. The first food to arrive at the table was complimentary banchan from the kitchen — an assortment of eight to ten small dishes in many colors (greens, seaweed, clams, fermented beans, small scallion pancakes, house-made kimchi, grated radish and tofu soup). Just as we were tucking into these small bites, our waiter appeared and laid the grill over the coals. 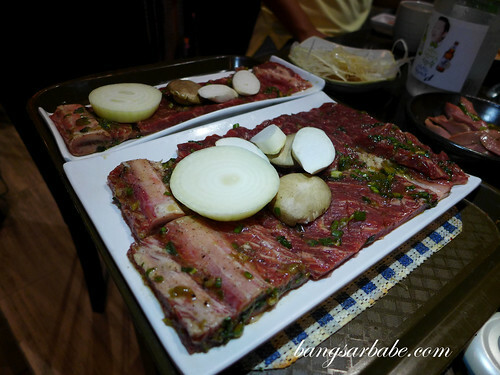 He then brought out our meat platter of kalbi (beef short ribs) and marinated sliced pork, and placed them on the grill. Medium rare, just how I like it! 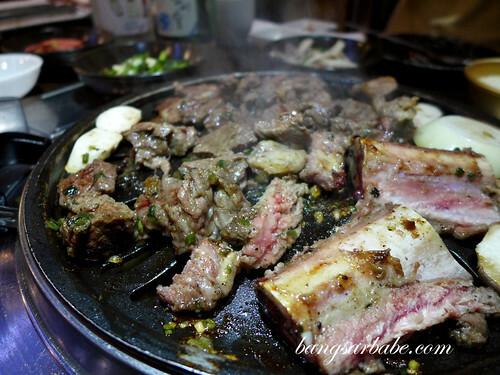 Once the meat is cooked, he picked it up with a tong, and cut it into pieces with scissors. All this was done in two or three minutes, and we were asked to tuck into the still-hot meats. The marinade was excellent. 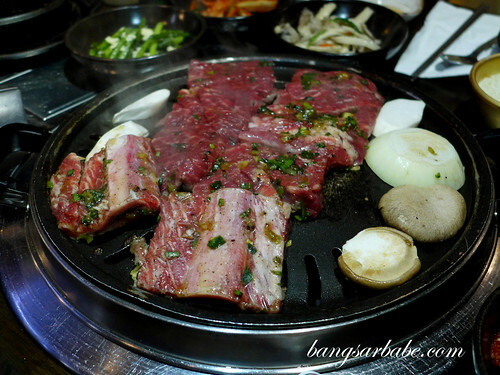 The meats were terrifically flavoured and tasty when eaten with rice or wrapped in lettuce. I prefer the latter as I like the combination of crisp greens and hot meat with a slather of spicy bean sauce. Good stuff. Also delicious is the Korean buckwheat noodles — toothsome texture in ice cold broth. You basically add the ice mixture into the noodles and stir well. Ice cold. This is an acquired taste. You either like it or you don’t. Cut up the noodlew slightly before eating and season with vinegar if you like. This is perfect for the hot weather but I’d much rather sweat it out over a bubbling hot pot of kimchi jjigae. 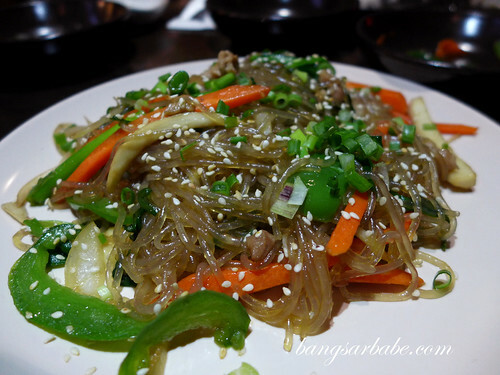 Jap chae is a tasty stir fry of glass noodles (made from sweet potato), beef slices and vegetables with a fragrant soy and sesame sauce. Apgujeong’s version did not disappoint; this was well flavoured and cooked till the noodles were justly chewy. I can’t decide if Apgujeong is better than my regular spot, Little Korea. 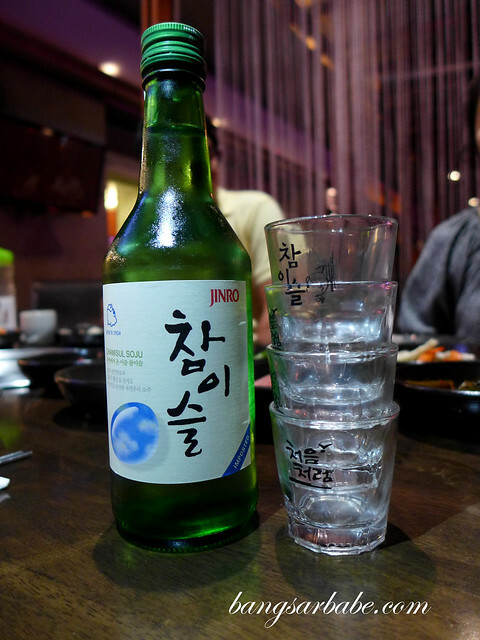 Both have their advantages — Apgujeong serves tastier banchan and the meat marinade is good. But I like the Jap chae at Little Korea better and the kimchi is more to my liking. Sour, spicy and gingery. Used to frequent this place, but was dissapointed w the service and food quality yesterday. Was told refill of banchan was not allow on saturday and service was pretty slow. Also the portion of the meat is smaller. 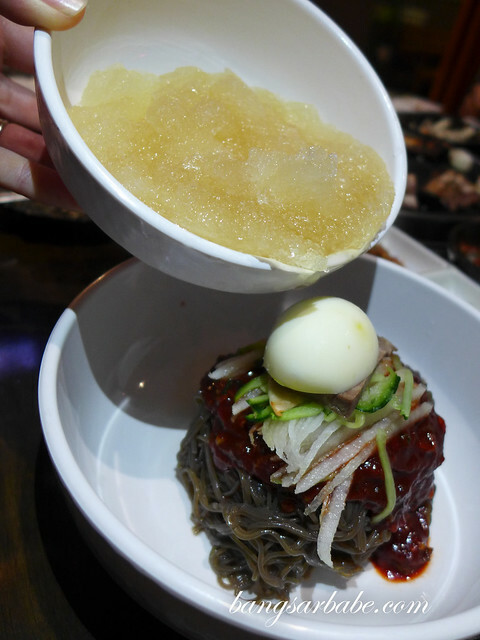 The mul naengmyeon served was not chilled enuff too.